With his background writing for Coronation Street, playwright Ben Tagoe knows how to crank up the tension in a confined space. 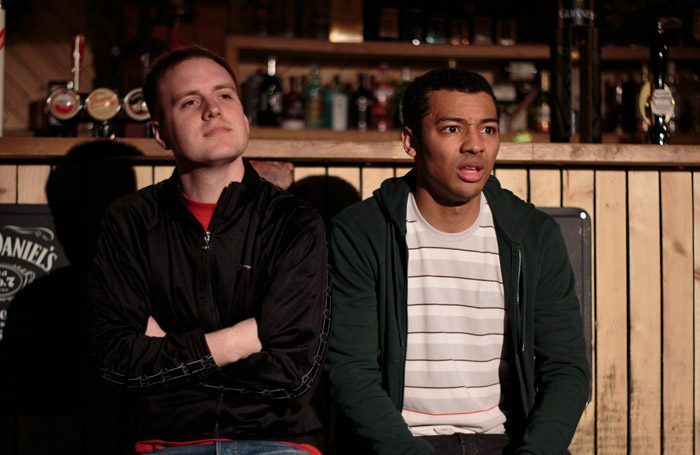 With When We Were Brothers, his first play in four years, the space in question is an underground bar in Bradford called, helpfully, The Underground. The play opens with Levi Payne’s Danny recounting the moment when, as a seven year old, the local bully sat on his chest outside the flats where he grew up. Danny vividly recalls besting the bully and beating his head into the ground. It is a moment that echoes a dozen years later when we hear how Danny’s best friend Tommo, (Philip D McQuillan), lets go of his own contained rage and beats his bullying uncle Trevor into an even bigger mess. Tagoe’s play skips through the years. Tommo and Danny grow into young men, each pursuing very different paths. Mixed race Danny is followed through his life by racial slurs, unable to outrun the ’N word’ even when he leaves working class Bradford for middle class London. Meanwhile Tommo remains trapped in his own life with the weight of failure threatening to pull him under. Aisha Khan’s production is deftly directed and the performances are beautifully judged, particularly McQuillan who grits his teeth and tenses his body in the face of his increasingly desperate situation. The performances elevate things, resulting in an often heart-wrenching piece of theatre. Containing echoes of Andrea Dunbar’s working class stories, this is an ultimately uplifting tale of hope.